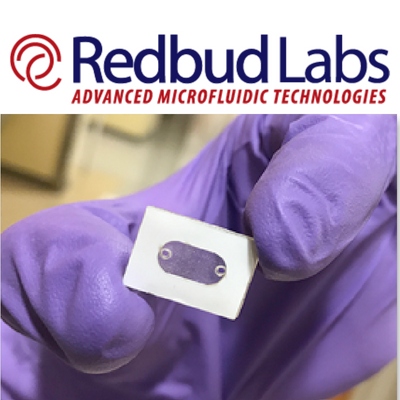 A spinout of UNC’s physics department, Redbud Labs is a microfluidic chip manufacturer that launched its first product, MXR, in 2017. The company will be moving from UNC to Building 400 at The Frontier in late summer 2018. The thing about startups? “There are always surprises,” says Ricky Spero, CEO of Redbud Labs. Originally called Rheomics (rheology + proteomics/genomics), the company was formed in 2012. After a couple of years doing just that, the group brought on Jay Fisher, who is now VP of Engineering. Jay was also a student in Rich’s lab (a few years ahead of Ricky) and went on to do his post-doctorate work at Harvard. 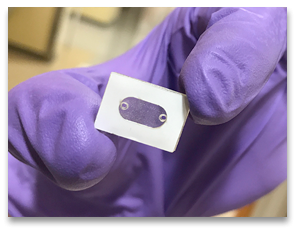 The timing was perfect; Jay found himself back in North Carolina right as Redbud landed its first funding—an NIH SBIR grant—in 2012. “Jay was the one who figured out how to get the underlying tech to really work,” Ricky says. Going directly from school to helping found a startup was a unique experience for Ricky as well. “It’s just a different path to take,” he says, but one he doesn’t regret taking. “The thing that I discovered about myself in grad school that I really love systems engineering,” Ricky says. He explains that compared to other roles on a technical team, which are focused on specific components of a process, his role is about how each component fits together. The realization of MXR’s groundbreaking potential over the past year has led to rapid growth on the Redbud Labs team. They quickly understood they needed space to accommodate all of their new business functions: a dedicated production suite, top-notch R&D spaces with a full applications lab and bio lab, and a shop to show how their products can be incorporated into larger products, plus—a first for Redbud team—office spaces. To learn more about MXR and Redbud Labs, visit redbudlabs.com. To learn about leasing lab space at The Frontier, contact busdev@rtp.org.